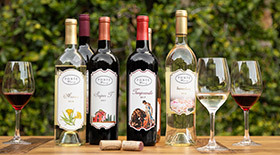 Experience a Day in the Country at home by purchasing wine, gifts or gourmet foods from our Online Store. Whether you are entertaining guests or snuggling up by the fire with a loved one, have the Ponte experience delivered to your door. Cheers! Our Charming Spanish Darling… Members Get 30% Off!